Skirt and Blouse courtesy of Lafayette 148 NYC. Dan Lawson is the costume designer behind hit TV shows such as the Good Wife and Limitless. 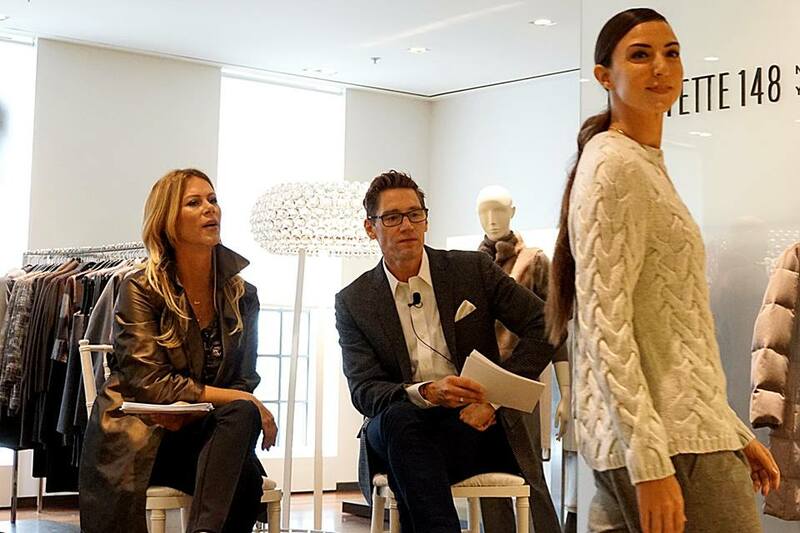 He was recently here in DC at Saks Fifth Avenue in Chevy Chase to unveil the fall fashion line for Lafayette 148. During his busy stop I was able to interview him about his work on the Good Wife, the next big fashion trend, and is dressing up for work still necessary? Hope you enjoy and check out Lafayette 148. I’m a fan of their clothing line. I appreciate they have a plus size line, fabulous looks for the office, and staple investment pieces of clothing. 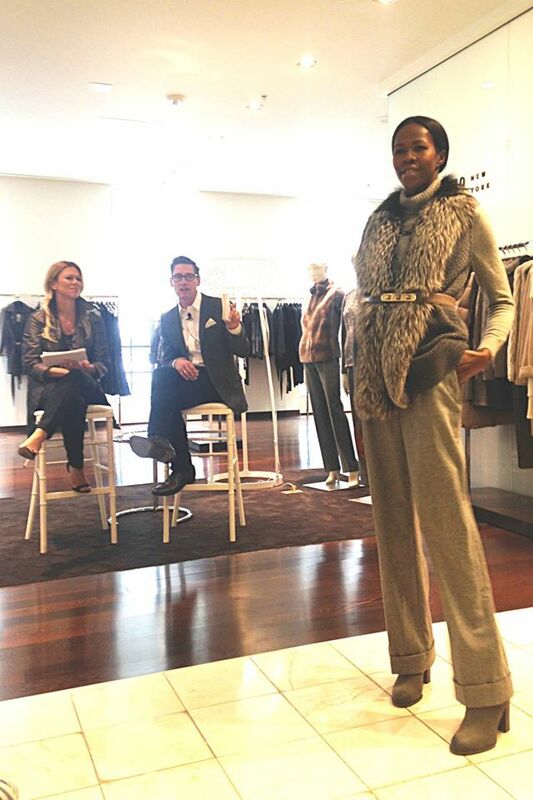 Dan Lawson Talking about Lafayette 148’s Fall Looks. What’s the difference between styling lets say a celebrity client for an awards show and costume design for a major TV show like the Good Wife? Styling is all about the surface. Costume design is rooted in character and story and helping to illustrate the characters and their arcs. I’m not saying that styling doesn’t have some basis in character, but it doesn’t utilize near as deep a foundation as costume design. What’s the difference in how you approach styling characters on The Good Wife vs. Limitless? When I work on a look for TGW, I always ask myself, “Does it look sophisticated and elegant?” When I work on a look for Limitless, I ask myself, “Does it look adventurous?” Both shows have to have a level of reality or believability to them but they are very different shows that take place in very different worlds. I always think of TGW as kind of an oil painting full of deep, rich pigments. That’s why Lafayette 148 New York is one of my very favorite “go to” brands – always chic and elegant in luxe fabrics and fantastic colors. I think Limitless is more monochromatic, stark and modern looking. From a practical standpoint, I always have to deal with multiples of outfits for Limitless. I have to be able to have the ability to get several versions of any given outfit for stunts, photo doubles, progression of age and distressing. TGW is usually more about one of a kind pieces for wardrobe. Not that I only use one of a kind pieces, but I certainly don’t have to worry about lots of versions of the same outfit. Where do you gain inspiration for dressing the characters of the Good Wife? Was it a specific friend or client that inspired a look? Inspiration initially came from real life, like the Spitzer story and images of real lawyers. Then I turned to the fashion world and magazines and elegant people on the Upper West and East Sides of NYC. I also used lots of images of real Chicagoans. I wanted there to be a sense of the midwest, albeit a major urban area in the midwest for sure. As a designer, I get inspiration from everywhere, from paintings to magazines, from the bus to the theater. I feel like I am always mentally cataloging images for upcoming scenes and projects that have yet to even be written. It seems like society is becoming more casual but the characters of the Good Wife really use clothes as a statement. Why is it important to still dress chic and elegant? I think it’s important to dress nicely for work. My aesthetic on TGW definitely gives a nod to the formality of the workplace of the 50’s and 60’s. I know we all want to be comfortable all the time, but I think approaching work as a place that is a little special helps elevate our feelings about work and the day in and day out pressures of it. I also think by contrast, dressing for work makes dressing casually that much more savory and enjoyable. I happen to think it’s fun to dress for my work day. I used to wear a tie all the time, even in college I wore ties sometimes to class. I find it emotionally uplifting and from a strictly selfish point of view, I think it is fun to see people who are well put together and who take their work as seriously as they take their play, which actually describes Chicago to a “T” I think. They have such a nice balance of work hard/play hard. I like that. I like buying investment pieces of clothing and mixing them with more affordable ones. What pieces of clothing would you recommend spending money on? Definitely the staples. They are going to be the workhorses of your closet and you are going to be wearing them a lot. So they need to last. Often spending some extra money on these pieces will help ensure that they last for a long time. Flare pants, jean skirts, and turtle necks seem to be in this fall…what do you think will be the next big clothing trend? Yes, we are definitely having a wonderful flirtation with the 70’s again. As for the future, well, I say coyly, wouldn’t it be great if it was about dressing beautifully for work?! Posted on October 4, 2015 in DIY Womanhood. Fashion model in the house!